Custom Kids White Frame Classic Sunglasses with Neon Assorted Color Arms is a fantastic choice to make your kids promotions stylish and impressive. The assorted color - White (frame), Neon Orange, Neon Pink, Neon Yellow, Neon Green (Arms) color combination will surely catch the eyes of kids as well as the adults accompanying them. The UV400 protection works like a cherry in top of a cake. Sports equipment stores and amusement parks can make use of these customized sunglasses for their promotions. White frame and neon arms combinations make these sunglasses charming. 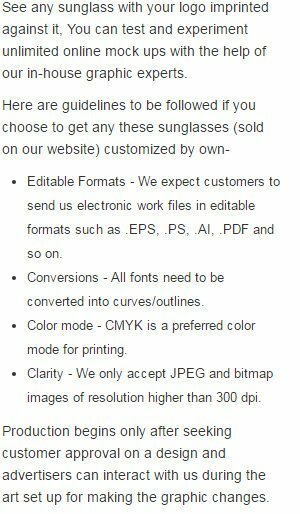 Order these custom kids sunglasses fast to get our free online proofs and free artwork design services. Request a quote to know the value savings that you can avail on bulk orders of Custom Kids White Frame Classic Sunglasses with Neon Assorted Color Arms.